Historical Background: J.T. Staley, History of Wrought-Aluminum-Alloy Development. Conventional Aluminum Alloys: E.A. Starke, Jr., Heat-Treatable Aluminum Alloys. R.E. Sanders, Jr., S.F. Baumann, and H.C. Stumpf, Wrought Non-Heat-Treatable Aluminum Alloys. Processing of Aluminum Alloys: D.A. Granger, Ingot Casting in the Aluminum Industry. M.A. Zaidi and J.A. Wert, Thermomechanical Processing of Aluminum Alloys. C.E. Cross and G.R. Edwards, Welding of Aluminum Alloys. C.C. Bampton, J. Wadsworth, and A.K. Ghosh, Superplastic Aluminum Alloys. Current Aluminum Alloys: W.E. Quist and G.H. Narayanan, Aluminum-Lithium Alloys. S.J. Harris, Fiber-Reinforced Aluminum Alloys. R.J. Bucci, L.N. Mueller, L.B. Vogelesang, and J.W. Gunnink, ARALLR Laminates. G.J. Hildeman and M.J. Koczak, Powder-Metallurgy Aluminum Alloys. Microstructure and Properties of Aluminum Alloys: D.B. Williams and P.R. Howell, The Microstructure of Aluminum-Lithium Base Alloys. S.R. Nutt, TEM Characterization of Aluminum-Base Composites. J.M. Sater, S.C. Jha, and T.H. Sanders, Jr., Microstructure and Properties of Rapidly Solidified Aluminum-Transition Metal Alloys. A.K. Vasudevan, R.D. Doherty, and S. Suresh, Fracture and Fatigue Characteristics in Aluminum Alloys. N.J.H. Holyrod, A.K. Vasudevan, and L. Christodoulou, Stress Corrosion of High-Strength Aluminum Alloys. G.M. Scamans, J.A. Hunter, and N.J.H. Holroyd, A Surface-Engineering Approach to the Corrosion of Aluminum. J.W. Watson and M. Meshii, Hydrogen in Aluminum and Aluminum Alloys. D.J. Field, Oxidation of Aluminum and Its Alloys. B.A. Parker, Formability and Microstructure. W.G. Fricke, Jr., and M.A. Przystupa, Texture. J.D. Embury, D.J. Lloyd, and T.R. Ramachandran, Strengthening Mechanisms in Aluminum Alloys. Competitive Materials to Aluminum: F.R. Jones, Fiber Reinforced Plastic Composites. J.C. Williams and G.W. Kuhlman, Titanium Alloys. R. Busk, Magnesium Alloys. Appendix. Index. 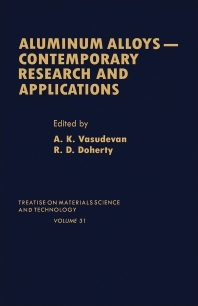 Contents of Previous Volumes. Researchers and advanced students in metallurgy and materials engineering.